In today’s episode, cohosts Leigh and Gretchen head way back in time to Ancient Egypt. That’s right, get ready to walk like an Egyptian! Take a tour through Egyptian mythology to discuss Atum as both male and female, Set’s interactions with Horus, Nephthys’ spending all her time with Isis, Hapi’s non-binary gender presentation, and what Set and Nephthys imply about Egypt having a concept of third gender. Plus, the dancing woman mummy, gender transformation in burial, the gender presentation of women pharaohs like Hatshepsut, and Gretchen’s favorite gay Egyptian tomb! You’ll see why having 3 genders in Ancient Egypt is more likely than people think! Atum, the original deity with both male and female aspects. Set (Left) and Horus (Right) bind the plants of Egypt (Source). Nephthys (Left) and Isis (Right) guard the body of Osiris (Source). 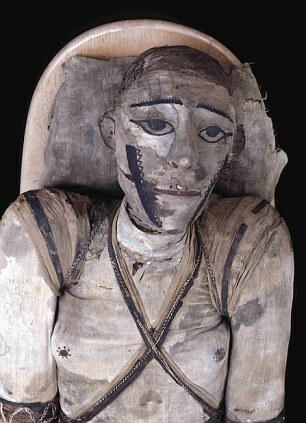 Hapi, God of the Nile, depicted as having both male and female presentation. Akhenaten (right) was frequently depicted similarly to Hapi as having breasts and a large belly. 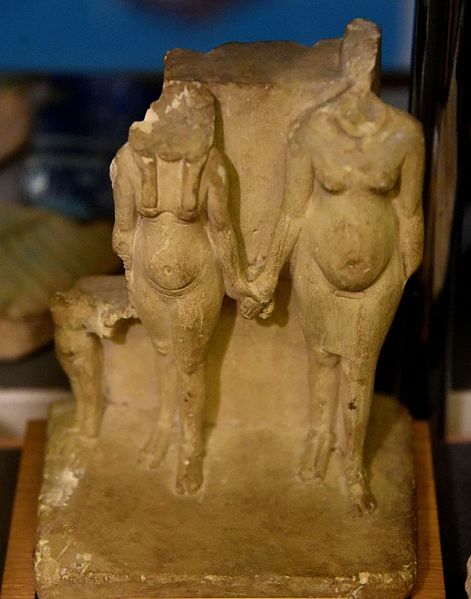 Compare his body with that of his wife Nefertiti (left). 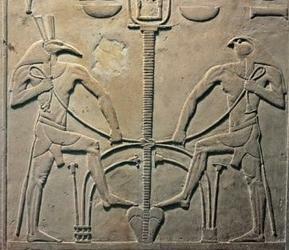 Note the pharaonic headdress and naked torso, both typically masculine symbols. 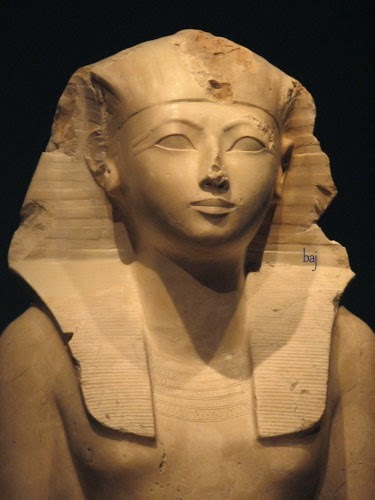 Hatshepsut with her fake beard! In this statue, hatshepsut lacks a beard but sports the royal cobra, headdress, and the crook and flail. ONce again, the royal headdress and naked torso of the pharoahs on a woman who ruled as Pharaoh. 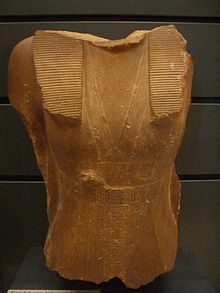 Bust of Sobekneferu with loincloth and royal headdress visible. 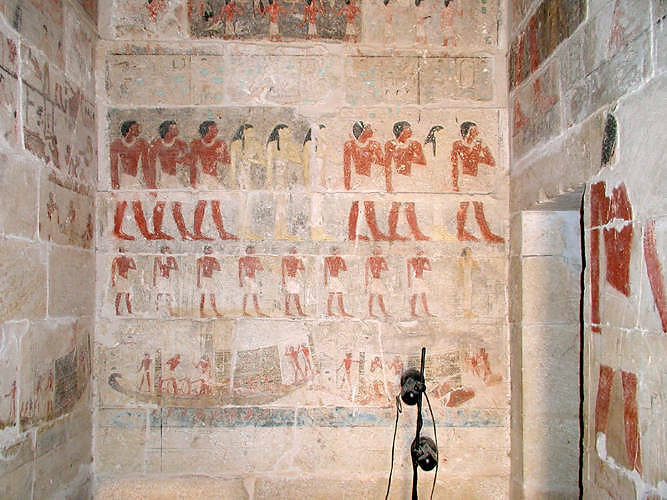 Image from the Tomb showing the family procession. Niankhkhnum (Left) and Khnumhotep (Right) embracing on the walls of their tomb. Close up of Niankhkhnum and Khnumhotep nose kissing, one of the most intimate positions two people could have in Egyptian iconography. Image of the Jackals? Hyenas? getting it on in the hunting scene from the walls of the tomb.